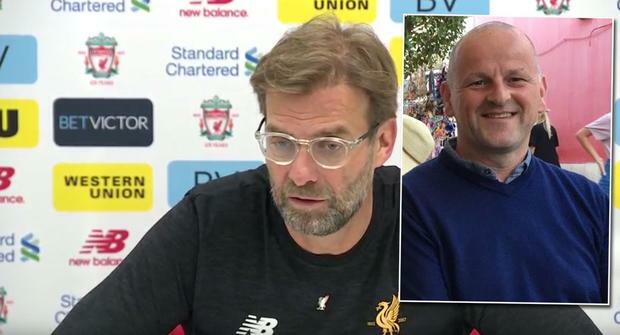 LIVERPOOL manager Jurgen Klopp has said he was stunned when he was informed that Irish Reds fan Sean Cox had been seriously injured in a violent attack ahead of the Champions League semi-final. Father-of-three Sean was attacked outside The Albert pub in Liverpool on Tuesday evening. Sean and his brother were waiting outside the landmark pub ahead of the Champions League semi-final clash with Roma when the attack occurred. Mr Cox sustained severe injuries and is currently in an induced coma in the Walton Neurological Centre near Anfield stadium. His devastated family must wait over the weekend until medics begin the process of trying to wake him. Only then can they begin to assess the degree of injury he has received, how long term it is likely to be, and if surgery was a success. Klopp has offered an emotional tribute to the injured fan as he wished him a speedy recovery, while also wearing a Liverpool badge in the Irish colours in a show of support. "I think the game on Tuesday night showed the beauty of the game during it. It also showed ugly parts before it," said Klopp. "When I heard, I cannot describe my emotions. That should never happen, before or in the future. "We all have to do everything to ensure that doesn’t happen again. Nobody has a solution but it is unbelievable that something like this can happen. All our prayers are with Sean and his family." On Thursday the Cox family issued a statement through Merseyside Police, saying all they want is to have him home safe. “We want the world to know that Sean is the most amazing and wonderful husband, dad, friend, son, uncle, and brother and he has brought us all nothing but joy. “He is a truly decent man who adores Liverpool FC and just came over from his home in Co Meath to watch his beloved team,” it said. “We are completely devastated by what has happened to our lovely, caring Sean and all we want is for him to come home to his loving wife and three children." Klopp also offered advice to Liverpool fans travelling to Rome for the second leg of the Champions League semi-final next Wednesday, as he admitted he was concerned for travelling supporters. "It is a really difficult situation. I have never been in a situation like that," he stated. "The only thing, and it is always how I see it, it is all about football. It is only football. Nothing more and nothing less. I never understood people who don’t accept that. "I am pretty sure everybody who is involved in keeping people safe will do their best and everything they can. I am not too concerned about that. "If Rome go through, they deserve it. If we go through, we deserve it. Around the stadium, nobody should think about anything else but the game." Klopp urged Liverpool fans to make steps to steer clear of trouble in Rome, as he urged them to take every precaution to ensure the game passes off without incident. "It is common sense. What can I say that they don’t already know? It is easy to say - behave," he added. "Like you want to be treated. If you are alone in the street, you want to feel safe. "I don’t know, we could have 1,000 problem fans but since I have been here I haven’t heard about that. If police think they have to be more concerned, keep an eye on them. "I really don’t like that part of football. I am not smart enough to understand it. We have to talk about it but it shouldn’t be like this. As long as we want to have the game as we do, with away fans in stadiums, we have to show our responsibility. I hope that everybody is in that mood."